•	Making records of the symptoms and medical histories of patients. •	Sometimes Registered Nurses must supervise other medical professionals, such as home health aides, nursing assistants, and licensed practical nurses. •	Pediatric nurse: The pediatric nurse specializes in the care of children and teenagers. Pediatric nurses find employment in several different work environments, including doctor’s (specifically pediatricians’) offices and hospitals (especially children’s hospitals). •	Oncology nurse: The oncology nurse specializes in the treatment and care of cancer patients. Oncology nurses are on the front lines of cancer treatment, providing vital assistance to doctors. •	Rehabilitation nurse: The rehabilitation nurse (or “rehab” nurse) specializes in the care of patients with disabilities and/or chronic illnesses who are working to gain and keep up the maximum function of their bodies. Rehabilitation nurses are essential in not only providing care and assisting in the provision of treatment but also in providing essential advice and guidance to patients and their families. •	Nephrology nurse: Nephrology nurses specialize in the area of kidney disease. Nurses in this specialty can find employment in many different possible settings, including dialysis clinics, transplant program facilities, doctors’ (especially kidney specialists’) practices, and hospitals. •	Neonatology nurse: The neonatology nurse (often referred to simply as a neonatal nurse) works with newborn infants born with medical problems, such as prematurely born infants. •	Genetics nurse: The field of genetics nursing is one of the newest and most exciting areas of specialty. Genetics nurses work with patients who are genetically at risk of developing diseases such as Alzheimer’s, diabetes, cancer, heart disease, and others, as well as people who already have such diseases. Genetics nurses are trained to carry out special assessments of patients’ genetic risk, and to perform the data analysis. •	Critical care nurse: The critical care nurse specializes in caring for the critically and acutely ill. Most critical care nurses work in hospitals, especially in intensive care units, emergency departments, recovery rooms, cardiac care units, cardiac catheter labs, neonatal ICUs, pediatric ICUs, and telemetry units. •	Cardiovascular nurse: The cardiovascular nurse specializes in the care of patients suffering from cardiovascular disease and problems. •	Addiction nurse: The addiction nurse specializes in working with patients struggling with addiction to such things as drugs and alcohol. Some Registered Nurses work in schools, as health clinic nurses. 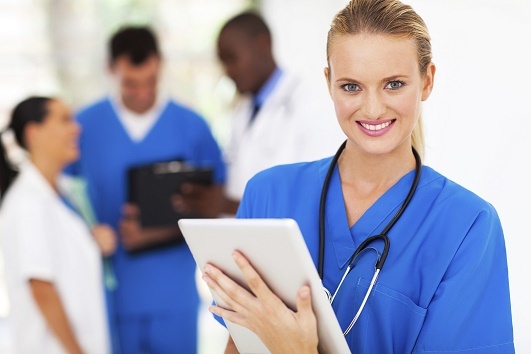 Some Registered Nurses decide to become qualified as Clinical Nurse Specialists (CNSs). The Clinical Nurse Specialist is a type of advanced practice registered nurse (APRN). Registered Nurses can find employment opportunities in a variety of different workplace environments. 61% of Registered Nurses work in state, local, and private hospitals, while 7% work in nursing and residential care facilities. 7% of Registered Nurses work in physicians’ offices, while 6% work for home healthcare services. 6% work for government. Other Registered Nurses work in outpatient clinics and schools, and others work in the military. Some nurses work as home health and public health nurses, and must travel to sites such as schools, homes, and community centers. Registered Nurses often must spend a great deal of time engaging in physical movement (stretching, bending, and walking), as well as standing. Registered Nurses tend to incur more back injuries than people in many other professions. Keep in mind that as a Registered Nurse, you will have to be comfortable with the reality of coming into much greater contact with disease than you would otherwise. Registered Nurses who work in places such as hospitals and nursing care facilities often are required to work at many different times of the day and night. Most Registered Nurses work on a full-time basis, with only about 1 in 6 working part-time. What Personal Qualities Do You Need to Succeed as a Registered Nurse? •	Physical, mental, and emotional stamina, resilience, and stability: Most Registered Nurses are required to move around a great deal, lift heavy weights, and be on their feet a large part of the day. •	Outstanding organizational skills and memory: For obvious reasons, Registered Nurses must be able to organize and keep track of patient information and records, as well as patient care plans. •	Ability to pay close and constant attention to detail: The Registered Nurse’s ability to pay close and constant attention to detail is a necessity in providing correct and timely patient care. •	A strong ability for consistent empathy and compassion: The Registered Nurse must have a strong and consistent capacity for empathy and compassion for their patients. •	A caring and understanding manner: The Registered Nurse must consistently demonstrate their empathy and compassion through their verbal and non-verbal communication with patients. •	Excellent communication skills (speaking and active listening): Registered Nurses must have strong active listening skills, and show that they understand what patients tell them. They must also have strong verbal communication skills, so that their instructions and comments to patients are readily understood and remembered. •	Sound critical thinking skills and judgment: Registered Nurses need to have well-developed critical thinking skills and judgment in order to ensure that they are able to work with a high degree of autonomy in their sphere of care. In order to become a registered nurse in Arizona, you must gain entry in and complete an accredited nursing education program that will culminate in your taking the National Council Licensure Exam for Registered Nurses. When you pass the exam, you will be able to gain licensure to practice as a Registered Nurse in Arizona. This exam is administered in Arizona by the National Council of State Boards of Nursing. In order to qualify to write the exam, you will need to apply to the Arizona State Board of Nursing. Nursing programs in Arizona can be found at public colleges and universities. They can be either associate’s degree (Associate’s degree in nursing, or AND) or bachelor’s degree programs (Bachelor of Science degree in nursing, or BSN). Nursing programs involve both classroom (lecture style) learning and lab sessions (a strong clinical component). They also provide significant practical experience in a real workplace setting. Carefully look at the requirements for entry to each prospective program, as they will vary (sometimes significantly) from school to school and program to program. You will find that some of them may have course prerequisites. You may also be required to provide proof of CPR certification, in addition to drug test results, fingerprints, references, standardizes test scores, and transcripts. If you choose to complete your nursing education in an associate’s degree program, you will have the option of continuing your education later on by completing a bachelor’s degree program. Obtaining the bachelor’s degree qualification would likely help to boost your salary in such a case. Having a bachelor’s degree also opens up the possibility of gaining an administrative position in the field. Arizona’s Nurse Practice Act dictates that education programs must properly train future nurses to provide a wide variety of different kinds of care, including caring for adults, caring for patients looking for wellness care, caring for premature infants, caring for infants, caring for patients who suffer from mental conditions and impairments, and caring for geriatric patients. Once you have your license as a Registered Nurse in the state of Arizona, you will be required to take continuing education courses on a set basis in order to maintain your license. Your nursing education program should include courses in areas such as microbiology, nutrition, anatomy, physiology, chemistry, and social and behavioral sciences (including psychology), often in addition to a smaller number of liberal arts courses. If you choose the BSN route, you will probably be required to take additional courses in leadership, critical thinking, communication, and social and physical sciences. The Bachelor of Science degree in nursing program is usually four years in length, whereas programs leading to an associate’s degree in nursing are usually two to three years in length. Your nursing education program must include supervised clinical experience. You should be aware that many employers (especially hospitals) require all their nurses to have the BSN degree. People who are already qualified as Registered Nurses but do not have the BSN degree are able to go back to school to get their bachelor’s degree in nursing. Programs for such individuals are called RN-to-BSN programs. If you have a bachelor’s degree in a field other than nursing, you might want to find a special accelerated program that will lead to becoming qualified as a Registered Nurse. If after starting your career you want to become a clinical nurse specialist (CSN), you will have to earn a master’s degree in nursing. You will usually need to have at least one year (or more) experience in nursing before undertaking this. In every state of the United States (including Arizona), one must have a nursing license in order to practice as a Registered Nurse. In order to get such a license, you must successfully complete an approved and accredited nursing program. You must also pass the National Council Licensure Examination (NCLEX-RN). Once you are a nurse, you may decide to further your qualifications through accreditation by professional associations in particular areas of the field. Examples of such areas include pediatrics, gerontology, and ambulatory care. Occasionally, employers will ask for one of these specific qualifications. If you eventually become a CSN, you will have to satisfy Arizona’s licensing requirements for your particular specialty. In the United States as a whole, the median salary for Registered Nurses is $67,490 per year ($32.45 per hour). Job growth for Registered Nurses in the United States is much faster than the average of other occupations. The highest median salary for nurses is for those who work for government ($72,100). Nurses who work in state, local, and private hospitals have a median wage of $69,510, while those who work in home healthcare services have a median salary of $63,840. Registered nurses who work in physicians’ offices have a median salary of $60,820, while those who work in nursing and residential care facilities have a median salary of $60,370. In Phoenix, Arizona, the average salary of a Registered Nurse is $69,418 (with a range of between $61-747 and $78,346). Note that these amounts do not include possible benefits and bonuses. The median hourly pay for a Registered Nurse in Phoenix, Arizona is $35.13. As in many other professions, wages and salaries for Registered Nurses are often higher in urban, metropolitan areas than they are in more remote, rural locations.